Trip Cost: $1,895 - (6 Days/5 Nights). There is a $200 single supplement charge. Group size - 4 to 8. Spring wildflowers in May and autumn foliage at its peak in October beckon us to explore this hidden realm of hills and dales along the tri-state border of Massachusetts, Connecticut, and New York. This is an area steeped in history that will amaze you. And it's only a 4 hour drive away from NYC and Boston! Hike up Monument Mountain where Herman Melville, Nathanial Hawthorne and Oliver Wendell Holmes had an historic meeting of minds in 1850. Other mountain hikes include Alander, Everett, Race and Bear (Connecticut's highest) along the Taconic Range, giving us eye-popping vistas of the surrounding countryside with views of the Hudson Valley, Catskills, and Berkshire Hills. Elevations range from 800 to 3000 feet. We cover some nice sections of the Appalachian Trail like Lion's Head and Benedict Pond; visit Bartholomew's Cobble, a wonderful Nature Conservancy property with some rare plants for this zone; and do a stream-side ramble from New York to Bash Bish Falls just over the border in Massachusetts. 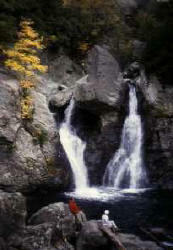 Explore the area near Sages Ravine on the Mass/CT border and the mysterious Ice Glen in Stockbridge. We'll stroll the streets of classic villages - Lenox, Stockbridge, Great Barrington, and Salisbury, CT; wWalk quiet country lanes, and visit the Norman Rockwell Museum among other sites. We stay at cozy Race Brook Lodge in Sheffield Mass. where a hike to the Appalachian Trail is right out the door. Dining is at the historic Stagecoach Hill Tavern next door and at other restaurants nearby in Great Barrington and Salisbury, CT.